At the 2017 Lightfair International Convention held in Philadelphia and attended by thousands of people, one major theme was developing technology and markets for LED horticultural lighting. 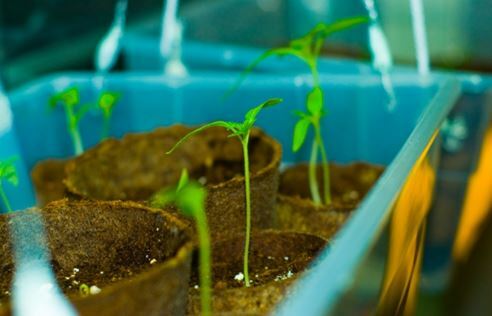 LED lighting is particularly conducive for plant growth, all while reducing energy consumption and adapting the light to meet the needs of varying crops. As a result, vertical farms sprout in unconventional locations, such as warehouses and storage units. LED horticultural lighting brings farms to the people, regardless of location, to meet a growing population’s demand for healthy and natural food. Now, research and development for new solutions in the Horticultural industry is supported by large federal and state R&D tax incentives. Lighting specifiers, lighting designers, and architects and engineers are now eligible for the tax credits when designing LED horticultural lighting systems. Eligible costs include employee wages, cost of supplies, cost of testing, contract research expenses, and costs associated with developing a patent. On December 18, 2015, President Obama signed the bill making the R&D Tax Credit permanent. Beginning in 2016, the R&D Tax Credit can be used to offset Alternative Minimum tax and startup businesses can utilize the credit against $250,000 per year in payroll taxes. The American population is trading open land for the congested atmosphere of urban life. Until now, farms could not follow the p eople to cities. However, with advanced LED lighting solutions, farming can exist in unconventional locations, such as dark warehouses or windowless storage spaces. Decreasing the inherent distance between farms and consumers will minimize loss in harvest, transport of goods, and overall shelf life. Consumers will receive fresher products more immediately, regardless of the time of year. One benefit of indoor farming is that the farms can continuously produce and yield crops year-round. Weather conditions are no longer a deciding factor since LED lighting can be tempered to immediately meet the growing demands of different vegetation. The farms also use a fraction of the acreage required for traditional farms. Although city spaces are hard to come by and expensive to purchase, indoor farms can be moved to warehouses on the border of major cities, while still being more beneficial to consumers than traditional farms located on the other side of the country. According to the 2014 WinterGreen Research "LED Grow Light Market Shares, Strategies, and Forecast Worldwide" report, the 2013 market for LED horticultural lighting was $395 million. It is projected that by 2020, the market will rise to $3.6 billion . This growth rate is supported by various commercial and university efforts that explore and promote LED Horticultural lighting in the US. Urban Produce is located in Irvine, California. It specializes in growing wheatgrass, baby kale, and numerous other organic greens. The plants are lined on shelves, and a computer program is used to monitor how much water and LED light the differing crops should receive. According to the Wall Street Journal, the company patented the “high-density vertical growing system” with the intention of decreasing fuel and shipping expenses. With the application of monitored LED lighting and water distribution, Urban Produce grows organic, healthy food with 80% less fertilizer than traditional farming techniques. Hubbell Lighting is a large lighting manufacturer that recently introduced a line of horticulture lighting products called NutriLED. Hubbell identified the optimal combination of blue and red LEDs. According to their research, blue LEDs are crucial for vegetative growth in plants, and red LEDs provoke fruiting and flowering. Because of this innovative and necessary discovery, the NutriLED product can be used by anyone in the Horticultural market. NutriLED can be scaled to meet any indoor farming requirements. What makes it unique from most other lighting options is that it can deliver a linear 60 degree beam spread, which is narrower than typical high-power LEDs, according to LEDs Magazine1. This is beneficial to the industry because now, farmers can place the lights between rows so that vegetation on the lowest shelves can be reached as easily via vertical illumination as vegetation on upper shelves. LumiGrow is a company that specifically creates LED lighting for indoor farming efforts. For 10 years, it is one of the leading companies working with commercial and research Horticultural facilities across America, including the Patterson Greenhouses in Broadway, North Carolina. The Patterson Greenhouse extended the growing season for tomatoes, especially in warmer regions of America with lighting and technology from LumiGrow. LumiGrow discovered that with blue LED lighting, plants flowered 3 days earlier . With red LED lighting, the plants developed thicker stocks and more vegetative growth. Because of customization in lighting and spectrum, a farm owner can control variables such as infrastructure costs and crop quality without compromising on energy, heat, or crops. Philips Lighting has been developing Horticulture LED solutions called GreenPower to condition any type of crop to grow, regardless of external factors. They have been successful implementing their “Light Recipe” around the world, which is sustainable for everything from vegetable production to cut flowers. The Light Recipe is intended to produce 20 to 25 harvests per year. Similarly to LumiGrow, Philips suggests ways to control the spectrum, light level, uniformity, position, how to deal with varying climate conditions, an d the benefits resulting from such energy saving techniques. Philips proved the benefits, including, but not limited to, increased production, shortening of growth cycles, better space utility, enhanced plant quality, energy savings, higher rooting survival rates, and other benefits in plant growth . Philips has taken its Horticulture LED solutions to commercial farms, including Green Sense in the Midwest. By working with Green Sense, a new research center was developed for Philips researchers to study specific light-growth recipes that will decrease the amount of time for plants to grow in year-round indoor farms. On Earth Day, 2017, Civic Farms LLC signed an agreement with the University of Arizona to conduct vertical farming with artificial light in UA’s Biosphere 2 complex. According to WSJ, they developed new cameras, sensors, and smart phone technology to monitor plant growth in the dome2. Over $1 million will be invested in their efforts, which includes employing student researchers for the next 5 years. CEO and co-founder of Civic Farms, Paul Hardej, exhibited his excitement for this agreement as he said, “A vertical farm can be 20 to 100 times more productive. The overall direction globally is indoors” . In January, 2017, Philips Lighting and Colorado State University hosted a summit about existing efforts in LED lighting research. Summit attendees could view the CSU Horticulture Research Center and their efforts in growing plants under LEDs. This center uses Philips products, including LED Horticulture lighting, Flowering Lamp, and Interlighting. Raker & Sons: Paul Karlovich from Raker & Sons expanded the research conducted by NCSU to improve rooting and growth of ornamental plugs with LED lighting in Michigan. He indicates a 5% improvement in rooting of Maverick Red geraniums and a 30% improvement for tuberous begonias11. Karlovich’s research is continuous, and he estimates that he will further improve the growing conditions by optimizing on controlling temperatures, light quantity and quality, and humidity. Utah State University: Professor Bruce Bugbee critically analyzed situations that would make adoption of LED lighting more suitable. He identified three factors as the most crucial for LED consideration. These include maintenance costs, spectral impacts on plant shape and size, and time to recover from the initial investment and adoption of LED lighting. He compares LEDs to HPS (High Pressure Sodium) growth lights, with the intention of helping Horticultural farmers make the right decision when investing in lighting. Rensselaer Polytechnic Institute and Cornell University: Research conducted by RPI and Cornell address issues that ought to be resolved when integrating LED lighting into indoor farms. The growers must be cognizant of the increased likelihood that fungus will grow indoors when there is no exposure to UV light. The circadian rhythm of plants is also not measured. Despite these challenges, further research and development in Horticultural LED lighting should present some solutions. Purdue has explored new avenues of research in Horticultural LED lighting, thus presenting the idea that eventually we can move plant growth to outer space. Their recent finding of a balance between red and blue LEDs, a 95-to-5 ratio, furthers efforts to develop crop-growth modules in space. 90% less electrical power is used in this version of targeted LED lighting, in comparison to traditional lighting. Furthermore, targeted LED lighting has 50% less energy consumption than full-coverage LED lighting. 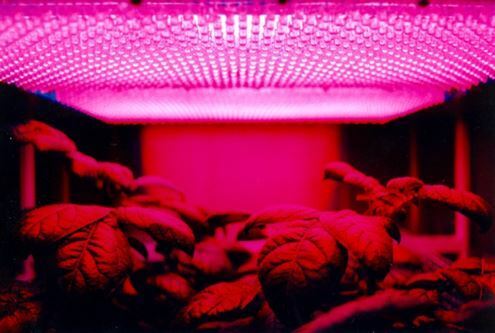 Professor of Horticulture and researcher Cary Mitchell found that, “Instead of the minimum 4-foot separation we had between conventional lamps and lettuce, we could get LEDs as close as 4 centimeters away from the leaves .” In so doing, Mitchell identified that they could reduce light costs and conserve energy in these controlled environments. This will be beneficial in promoting LED Horticultural lighting on Earth but also in future space exploration. MIT began its CityFARM research project in 2013 to facilitate indoor farming in urban settings. The effort estimates that it will decrease water consumption by 98%, eliminate chemical fertilizers and pesticides from the process, and diminish the amount of energy used by fourfold . Their research has been successful in making crops grow three to four times faster than the norm, on a 30-day cycle. They intend to further investigation in indoor agriculture, especially by collaborating with Detroit to expand on vertical farming in the city. They speculate that the harvests can be sold in the city, but also given to local food shelters . LED lighting has the most impact on Horticulture in urban farms. As the US population continues to grow, availability of fresh and healthy produce is becoming more of a challenge. Shipping vegetables from one side of the country to the other increases costs and risks associated with traditional farming. On the other hand, LED Horticultural lighting can bring farms to the people, regardless of urban or rural setting. Vertical farming in unconventional spaces has recently become popular amongst commercial and university research efforts. It is only a matter of time before traditional farming methods are replaced by advanced indoor farming techniques that incorporate customized LED lighting and technical control over variables that traditionally impact the success of plant growth and production.